If you're in need of a beach vacation, but can't make it happen in the near future, simply bring the beach to you! 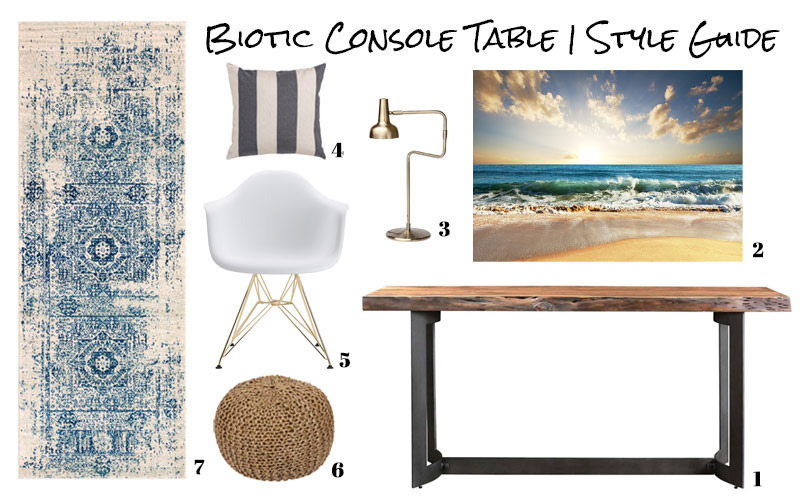 Our Biotic Console Table Style Guide will give you a 'Modern Coastal' vibe in your entry with just a few additions. The earthy textures of the console table and pouf combine with the beach print and striped pillow to set the tone and the boho runner, Table lamp and dining chair add a touch of modern to create a welcoming space. Whether you live in an urban studio apartment or in the burbs with a bit more room, you can channel the beach in your own home, minus the sand. Hooray!